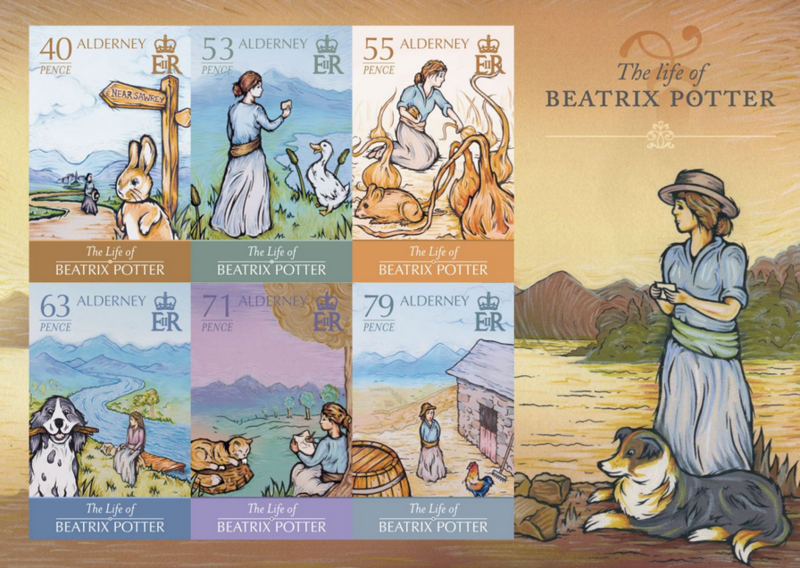 As you now, I always delight writing about literature and stories depicted on postage stamps, and this turn around, it is with outmost joy that I will feature the series of stamps issued by the Guernsey/Alderney Postal Administration on the life of Beatrix Potter with such beautiful illustrations. 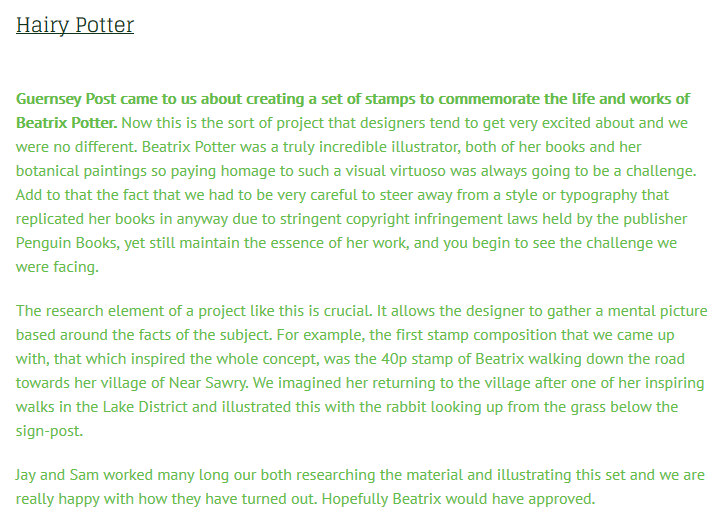 40p-> Beatrix Potter walking in the countryside nearby her hometown ‘Near Sawrey’. 53p ->Beatrix Potter feeding a duck; the scene is framed by the beautiful hills of the lake district in the background. 63p ->Beatrix Potter would often gather things to draw and include in her stories.The dog in the image is based on her springer spaniel called ‘Spot’. 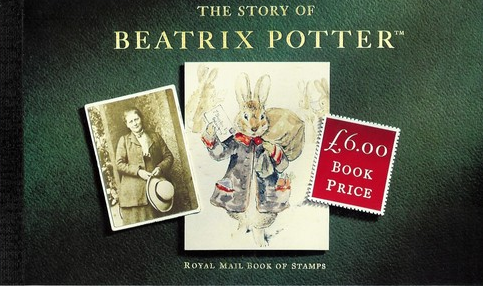 71p ->Beatrix Potter is pictured drawing a cat on a basket in reference to the Peter Rabbit story. 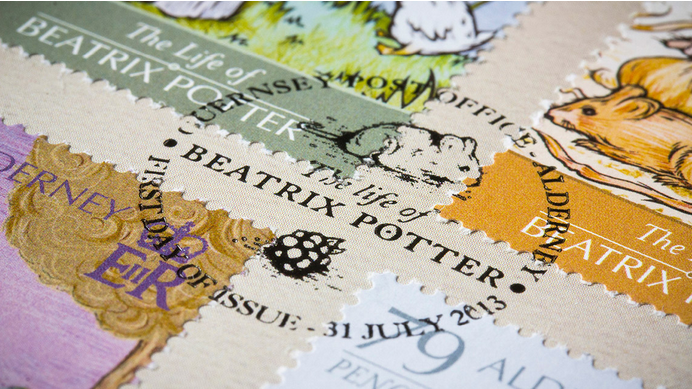 79p ->Beatrix Potter enjoying a stroll through an idyllic farm. 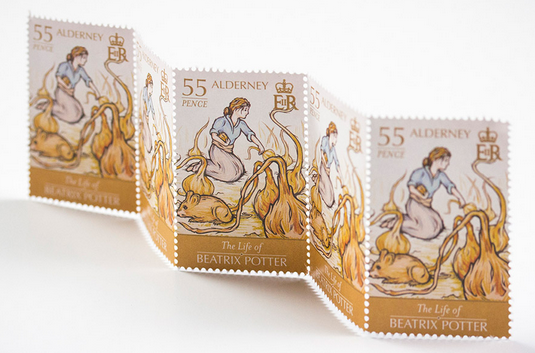 “My favorite stamp in the set is the 55p stamp, showing the mouse in the onion patch with Beatrix kneeling on the ground pulling up onions. I love the low down perspective – peering through the vegetable patch – and the fact that the background fades to nothing leaving the imagination to fill in the gaps. 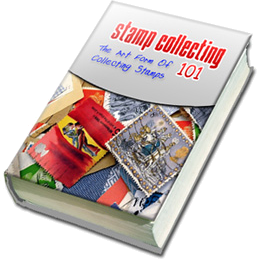 Do you agree with me that postage stamps are truly art in miniature? Simply gorgeous! Beatrix Potter was born on 28 July 1866 in Kensington, London, and showed an early interest in animals and the natural world, both of which are featured in her later children’s books. Her first book was The Tale of Peter Rabbit, published in 1902 with Frederick Warne & Co. She died in 1943 at the age of 77, having published more than twenty books. Many of them have been since adapted for Television and Theatre productions. The article Scotland, a great source of inspiration for Beatrix Potter at Scotiana.com joyfully take us on a journey into the marvelous book illustrations and lovely tales that we grew up with. 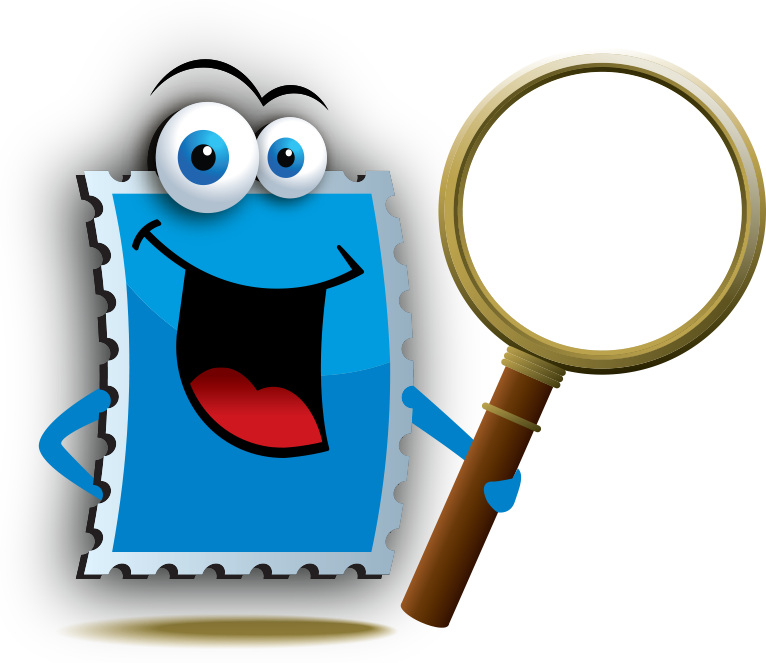 It is a great travel back in time celebrating one of the best-loved children’s authors!